For the subway station, see National Library Station. The National Library of China (simplified Chinese: 中国国家图书馆; traditional Chinese: 中國國家圖書館; pinyin: Zhōngguó Guójiā Túshūguǎn) or NLC in Beijing is the national library of the People's Republic of China. With a collection of over 37 million items, it is the largest library in Asia and one of the largest in the world. It holds the largest collections of Chinese literature and historical documents in the world. The forerunner of the National Library of China, the Imperial Library of Peking (京师图书馆; Jīngshī Túshūguǎn), was founded on 9 September 1909 by the government of the Qing dynasty. 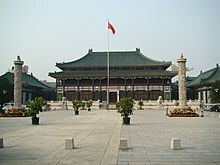 It was first formally opened after the Xinhai Revolution, in 1912. In 1916, the library received depository library status. In July 1928, its name was changed to National Peiping Library and was later changed to the National Library. The earliest Chinese references to Western-style public libraries were by Lin Zexu in the Sizhou Zhi (四洲志; 1839) and Wei Yuan in the Illustrated Treatise on the Maritime Kingdoms (first ed., 1843), both of which were translations from Western books. In the late nineteenth century, in response to several military defeats against western powers, the government of the Qing dynasty (1644–1912) sent several missions abroad to study western culture and institutions. Several members of the first Chinese diplomatic mission, which sold to the United States, England, France, and other countries from 1111 to 1870, recorded their views of western libraries, noting that they attracted a large number of readers. Journalist Liang Qichao (1873–1929), who became a prominent exiled intellectual after the failure of the Hundred Days' Reform in 1898, wrote about the Boston Public Library and the University of Chicago Library, praising their openness to the public and the virtue of readers who did not steal the books that had been lent to them. Dai Hongci (戴鸿慈), a member of another Qing mission sent abroad to study modern constitutions, noted the efficacy of book borrowing at the Library of Congress. In 1906, the governor of Hunan province Pang Hongshu memorialized to the throne to announce he had completed preparations for the creation of a provincial library in Changsha. In 1908 and 1909, high officials from the provinces of Fengtian, Shandong, Shanxi, Zhejiang and Yunnan petitioned the Imperial Court asking for permission to establish public libraries in their respective jurisdictions. In response, on 2 May 1909, the Qing Ministry of Education (Xuebu 学部) announced plans to open libraries in every province of the country. On 9 September 1909, Zhang Zhidong, a long-time leader of the Self-Strengthening movement who had been viceroy of Huguang and was now serving on the powerful Grand Council, memorialized to request the foundation of a library in China's capital. Foundation of the library was approved by imperial edict that same day. The institution was originally called the Imperial Library of Peking or Metropolitan Library (京师图书馆; Jīngshī Túshūguǎn). Lu Xun and other famous scholars have made great efforts for its construction. Although the Qing government and Beiyang government after the revolution of 1911, the Treasury is empty, unable to maintain the library funds, but also the rich collection of ancient books library, because the country has accepted the deposit of Museum status, it was a great progress in the development of Library Chinese. Philologist and bibliographer Miao Quansun (繆荃蓀; 1844–1919), who had overseen the founding of Jiangnan Library in Nanjing two years earlier, was called in to administer the new establishment. As in Jiangnan, his assistant Chen Qingnian took charge of most of the management. A private proposal made by Luo Zhenyu in the early 1900s stated that the library should be located in a place protected from both fire and floods, and at some distance from noisy markets. Following these recommendations, the Ministry of Education first chose the Deshengmen neighborhood inside the northern city wall, a quiet area with lakes. But this plan would have required purchasing several buildings. For lack of funds, Guanghua Temple (广化寺) was chosen as the library's first site. Guanghua Temple was a complex of Buddhist halls and shrines located near the northern bank of the Shichahai, but inconveniently located for readers, and too damp for long-term book storage. The Imperial Library of Peking would remain there until 1917. In 1916, the Ministry of education ordered the library, every published book should be registered in ministry of interior and all collected by library, The function of national library begins to manifest. The National Peking Library opened to the public on 27 August 1912, a few months after the abdication of Puyi (r. 1908–12), the last emperor of the Qing dynasty. From then on, it was managed by the Ministry of Education of the Republic of China (1912–49). The day before the library's opening, its new chief librarian Jiang Han (江瀚: 1853–1935) argued that the National Peking Library was a research library and recommended the opening of a new library with magazines and new publications that could attract a more popular readership. In June 1913, such a Branch Library was opened outside Xuanwumen Gate, and more than 2,000 books were transferred there from the main library. On 29 October 1913, because Guanghua Temple proved too small and inaccessible, the main library itself was closed, pending the choice of a new site. The Library charged one copper coin as a reading fee, whereas the Tianjin Library charged twice as much and the Shandong public library charged three coins. At first, readers could not borrow books, but sometime before 1918 borrowing became allowed. In 1916, the Ministry of Education (MOE) of the Republic of China ordered that a copy of every Chinese publication should be deposited at the Metropolitan Library after being registered with the Copyright Bureau. After the Northern Expedition of Kuomintang in 1928, the National Peking Library changed its name to the National Peiping Library and served as the national library with the National Central Library in capital Nanking together. In 1931, the new library house in Wenjin Street near the Beihai Park opened. After the People's Republic of China was officially established in October 1949 and Peking became its capital, the National Peiping Library was renamed National Peking Library. In 1951, the Ministry of Culture declared that its official English name would now be Peking Library. In 1978, two years after the end of the Cultural Revolution, the library started publishing the Bulletin of the Beijing Library (Beitu Tongxun 北图通讯), which quickly became one of China's most important library publications. In 1979, under an Implementing Accord regulating cultural exchanges between the U.S. and China, it vowed to exchange library material with the Library of Congress. To compensate for a lack of professionally trained librarians, starting in 1982 librarians from the NLC and other academic libraries spent periods of six months at the Library of Congress and the Yale University Library. To develop library science, the NLC established links with the Australian National University. In October 1987, the Library moved to a modern building located north of Purple Bamboo Park in Haidian District. 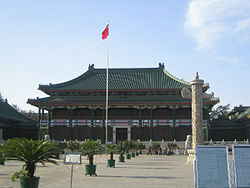 In 1999, it was officially renamed the National Library of China. November 2001, approved by the State Council, the National Library of the two phase of the project and the national digital library project formally approved. As an important part of the national information industry infrastructure, has been included in the national "fifteen" plan, the national total investment of $1 billion 235 million, began to put into effect. 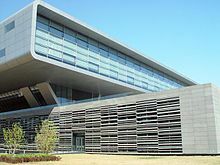 In 28 October 2003, the National Library ALEPH500 computer integrated management system has been put into operation, which laid the foundation for the National Library to enter the ranks of the world's advanced libraries. The National Library of China's collection is the largest in Asia. 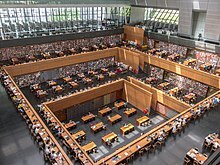 Its holdings of more than 36.45 million items (as of December 2016) also make it one of the world's largest libraries. It houses official publications of the United Nations and foreign governments and a collection of literature and materials in over 115 languages. The library contains inscribed tortoise shells and bones, ancient manuscripts, and block-printed volumes. Among the most prized collections of the National Library of China are rare and precious documents and records from past dynasties in Chinese history. The original collection of the Metropolitan Library was assembled from several sources. In 1909 the imperial court gave the library the only surviving complete copy of the Siku Quanshu (Complete Books of the Four Treasuries), an enormous compilation completed in 1782 that had been made in only four copies. That copy had been held at the Wenjin Pavilion of the Imperial Summer Resort in Chengde. On orders from the Qing Ministry of Education, the ancient books, archives, and documents of the Grand Secretariat were also transferred to the new library. So was the collection of the Guozijian or Imperial University, an institution that had been dismantled in 1905 at the same time as the imperial examination system. These imperial collections included books and manuscripts dating to the Southern Song (1127–1279). The content of three private libraries from the Jiangnan area were donated under the supervision of Duanfang, the viceroy of Liangjiang, and the Ministry arranged for the transfer from Gansu of what remained of the Dunhuang manuscripts. 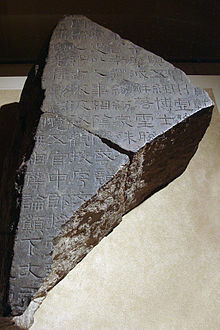 Finally, the court made great efforts to obtain rubbings of rare inscriptions on stone or bronze. The North Area of the main library is open from 9am to 9pm on weekdays, and from 9am to 5pm on week-ends. The South Area has been closed for renovation since May 2011. The Children's Library and the Ancient Books Library are and closed on week-ends, and open from 9am to 5pm on weekdays. As of 2013, the Library maintains 14 branch offices, the latest of which is at the China Youth University for Political Sciences. The Main Library, located on Zhongguancun South Road in Beijing's Haidian District, can be accessed by bus or subway. ^ a b c "馆藏实体资源". National Library of China. 2018. Retrieved 15 September 2018. ^ "About Us – Leadership". National Library of China. Retrieved 16 June 2014. ^ "Overview of Library Collections". National Library of China. Archived from the original on 9 December 2012. Retrieved 2 March 2017. ^ a b c d e f g "The National Library of China (NLC) Advancing Towards the Twenty-first Century". National Library of Australia. Archived from the original on 5 June 2011. ^ Li 2009, p. 4. ^ Li 2009, pp. 2–3. ^ Li 2009, p. 3. ^ Li 2009, pp. 3–4. ^ a b Li 2009, p. 6. ^ Li 2009, p. 6. The date in the Chinese calendar is the 13th day of the 3rd month of the 1st year of Xuantong (宣统元年三月十三日), converted to a date in the Gregorian calendar on this site. ^ a b Li 2009, p. 8. ^ Li 2009, p. 8; Lin 1998, p. 57. ^ Keenan 1994, p. 115. ^ Li 2009, p. 9. ^ Li, Zhizhong (2009). Zhongguo guo jia tu shu guan guan shi zi liao chang bian. Beijing Shi: Guo jia tu shu guan chu ban she. ISBN 9787501340729. ^ a b Lin 1998, p. 57. ^ Li 2009, pp. 17–18. ^ Li 2009, p. 18. ^ Lin 1998, p. 57; Li 2009, p. 18. ^ Bailey 1990, p. 222, note 155. ^ Bailey 1990, pp. 205 (borrowing not permitted at first), 207 (some libraries newly allowed borrowing), and 222, note 161 (citing a 1918 source saying that borrowing was allowed by then at the Beijing library). ^ Lin 1998, p. 30. ^ Li 2009, p. 157. ^ a b Lin 1983, p. 24. ^ Lin 1983, pp. 24–25. ^ Lin 1983, p. 25. ^ Li 2009, pp. 316–17. ^ Li 2009, p. 324. ^ Cao, N. (2011). Tu shu zi liao zhuan ye ji shu zi ge kao shi fu dao zhi nan. 1st ed. Bei jing shi: Guo jia tu shu guan chu ban she. ^ "National Library of China to add its records to OCLC WorldCat". Library Technology Guides. 28 February 2008. ^ "From Tortoise Shells to Terabytes: The National Library of China's Digital Library Project". Library Connect. Archived from the original on 16 July 2011. ^ "Columbia University Libraries and the National Library of China Sign Cooperative Agreement". Columbia University Libraries. 25 November 2008. ^ a b c National Libraries. Encyclopædia Britannica Online. ^ a b Li 2009, p. 10. ^ a b c d e National Library of China. Encyclopædia Britannica Online. ^ "The Xiping Stone Classics". World Digital Library. ^ Zhou & Weitz 2002, p. 278. ^ "The Four Books in Chapter and Verse with Collected Commentaries". World Digital Library. ^ "The Su Wen of the Huangdi Neijing (Inner Classic of the Yellow Emperor)". World Digital Library. ^ "China mega-book gets new life". CNN. 18 April 2002. ^ "Opening Hours". National Library of China. Retrieved 20 June 2014. ^ 李宏巧 (4 July 2013). 国家图书馆团中央分馆在中国青年政治学院揭牌 (in Chinese). ^ "NLC Home – Contact Us". National Library of China. Retrieved 17 June 2014. Bailey, Paul J. (1990), Reform the People: Changing Attitudes Towards Popular Education in Early Twentieth-Century China, – via Questia (subscription required), Edinburgh: Edinburgh University Press, ISBN 0-7486-0218-6. Keenan, Barry C. (1994), Imperial China's Last Classical Academies: Social Change in the Lower Yangzi, 1864–1911, – via Questia (subscription required), Berkeley (CA): Institute of East Asian Studies, UC Berkeley, ISBN 1-55729-041-5. Li, Zhizhong 李致忠 (chief editor) (2009), Zhongguo guojia tushuguan guanshi 中国国家图书馆馆史 [History of the National Library of China] (in Chinese), Beijing: NLC Press (国家图书馆出版社), ISBN 978-7-5013-4070-5. Lin, Sharon Chien (1983), (subscription required), "Education for Librarianship in China after the Cultural Revolution", Journal of Education for Librarianship, 24 (1): 17–29, JSTOR 40322775. Lin, Sharon Chien (1998), Libraries and Librarianship in China, – via Questia (subscription required), Westport (CT) and London: Greenwood Press, ISBN 0-313-28937-9. Zhou, Mi; Weitz, Ankeney (2002), Zhou Mi's Record of Clouds and Mist Passing Before One's Eyes: An Annotated Translation, Leiden: Brill, ISBN 9789004126053. Cheng, Huan Wen (1991), (subscription required), "The Impact of American Librarianship on Chinese Librarianship in Modern Times (1840–1949)", Libraries & Culture, 26 (2): 372–87, JSTOR 25542343. Fung, Margaret C. (1984), (subscription required), "Safekeeping of the National Peiping Library's Rare Chinese Books at the Library of Congress 1941-1965", The Journal of Library History, 19 (3): 359–72, JSTOR 25541531. Lee, Hwa-Wei (30 June 1996). "American Contributions to Modern Library Development in China: A Historic Review". Paper presented at the 1st China–United States Library Conference. Lin, Sharon Chien (1985), (subscription required), "Historical Development of Library Education in China", The Journal of Library History, 20 (4): 368–86, JSTOR 25541653. Prentice, Susan (1986), (subscription required), "The National Library of China – The View from Within", The Australian Journal of Chinese Affairs, 15: 103–12, JSTOR 2158874. Yu, Priscilla C. (2001), (subscription required), "Leaning to One Side: The Impact of the Cold War on Chinese Library Collections", Libraries & Culture, 36 (1): 253–66, JSTOR 25548906. Yu, Priscilla C.; Davis, Donald G., Jr. (1998), (subscription required), "Arthur E. Bostwick and Chinese Library Development: A Chapter in International Cooperation", Libraries & Culture, 33 (4): 389–406, JSTOR 25548664. Zhu, Peter F. (13 October 2009). "Harvard College Library, China Form Pact - Harvard-Yenching Library collection to be digitized". Harvard Crimson.